Hear about a special organization Anne’s involved with and get her tips on the latest astrology when she returns to WGN Radio 720 AM from 1 to 3 p.m. Central Daylight Time on Sunday, Aug. 23, 2015. 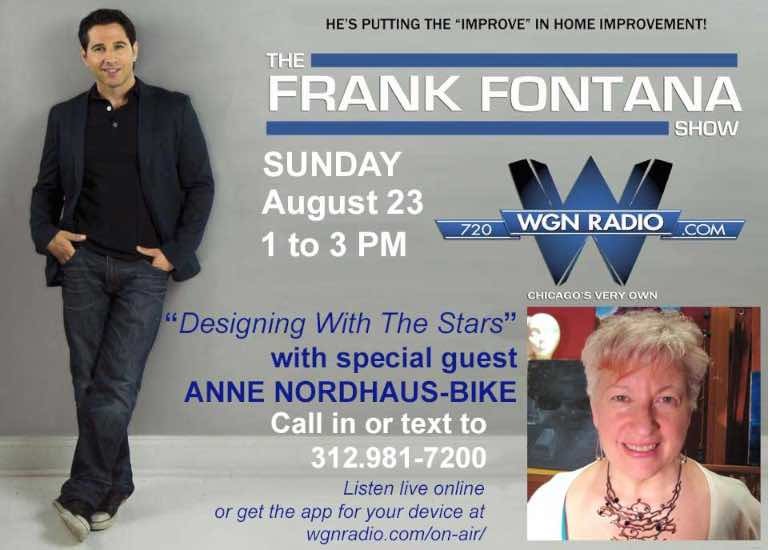 Join Anne that day for her popular “Designing With The Stars” segment, as she visits WGN Radio host Frank Fontana’s high-rated afternoon program. With Anne and Frank for the first part of the show will be representatives of Austin Special Chicago, a social service organization that assists adults with developmental disabilities due to mental and/or physical impairments. Austin Special Chicago is Anne’s favorite charity; her brother Peter is a client of the organization. Afterward, Frank and Anne will talk about current astrology, especially the big Virgo astrology energies that will affect everyone, worldwide, for the entire next year. They’ll also offer ideas on how to think about design for your sign during these times of major change. And, as always, they’ll be taking calls and texts from listeners.